On average, an Automotive Locksmith will charge around $250 to make you a set of remote car keys. On average, traditional, non-remote car keys will set you back by around $200. Costs vary depending on your car’s make and model. Of course, transponder keys cost more to replace. Stranded or Locked Out of Your Car? At NJ’s Locksmiths, our job is to get you out of any jam you might find yourself in. Fast, trusted, reliable and punctual – we are automotive locksmiths who’ve been rescuing car-owners from themselves for over 10 years! NJ’s Locksmith is Sydney’s Preferred Locksmith. We are preferred for a single reason – the quality of service we provide. At NJ’s Locksmiths, we are always fretting about service. Measuring it. Improving it – no matter what. If your car was born after 1990, chances are it will use a Transponder key. Transponder keys are different because of what is embedded in their head. A microchip. If you lose your car keys or have them stolen, your car could be stolen, or taken for a joyride. Using specialist automotive key equipment, we recode your key and the ignition switch it controls. Unless we recode your Ignition, your transponder key won’t work. Why are Transponder Automotive Keys More Expensive than Regular Car Keys? 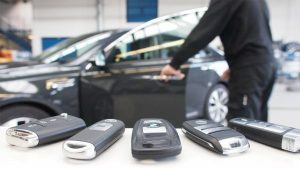 You can read more about the Automotive Car Key Services we provide on this specialised page we’ve set up on the topic here at Automotive Locksmith. As a professional automotive Locksmith in Sydney, service matters to us because it matters to the customers we serve. With us, you can expect a round-the-clock emergency locksmith service that operates 24X7. Our Night Owl Shift keeps us up – and busy – at night. Therefore, we can be on call whenever you have an emergency – have accidentally locked yourself out of car or misplaced your keys. You’ve got to love what you do. It makes all the difference to your work. Guaranteeing its quality – and not just that – also the service you deliver your clients with. Therefore, our clients (particularly our forgetful ones) keep coming back to us for service. For an Emergency Automotive Locksmith you can trust, please call us now for a FREE Quote on 0415 680 062. Alternatively, feel FREE to fill our Enquiry Form and SUBMIT it to us, now!